The Nugents family first came to England from France with William, Duke of Normandy in 1066. There they became known as ‘de Nogent’ reflecting their place of origin since family names were not widely used at the time. Three family members responded to William’s call to arms, to fight alongside him at the Battle of Hastings and help him become King William 1, establishing England’s Norman dynasty. 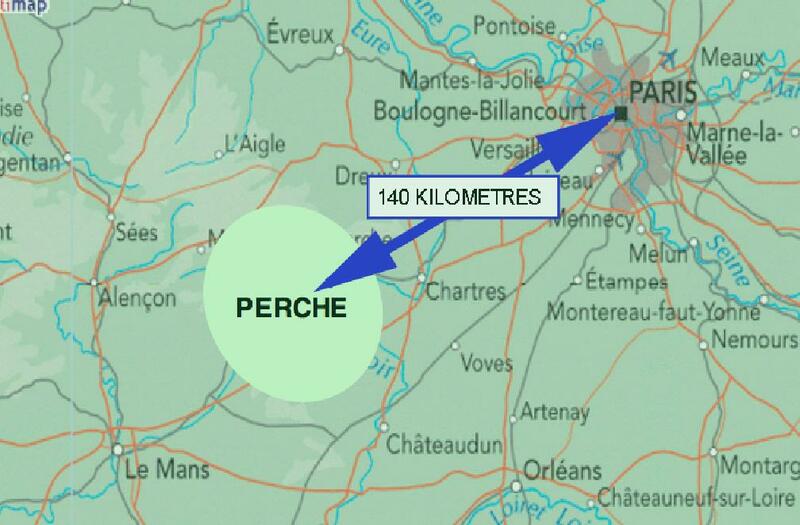 They came from the town of Nogent-le-Rotrou, south of Normandy and 140 kms southwest of Paris, in the Perche region, one of several French towns called ‘Nogent’ from the Latin for ‘new town’. 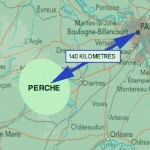 The nearest large towns to Nogent are Chartres, Le Mans and Châteaudun. Situated on high ground, Perche formed a buffer between the king’s domain and lands to the west whose people owed allegiance to the Duke of Normandy, founded as a fiefdom by Rollo, the Viking leader, in the year 911. There was constant tension between the French king and the ruler of Normandy. Around 963, Count Thibault le Tricheur (‘the trickster’) of Blois and Chartres, a vassal of the king, installed his protégé, Rotroldus (or Rotrocus), at Nogent to keep watch on the troublesome neighbours. Rotroldus built a château of wood, allegedly on the site of a previous Viking fort, and gave his name to the town in the Germanic variant of ‘Rotrou’ – sometimes transcribed as Rotron – which is said to mean ‘glorious promise’. The Château of Nogent-le-Rotrou, reinforced over a millennium, stills presides over this prosperous agricultural and manufacturing town on the banks of the River Huisne. The de Nogent or Nugent dynasty is recorded as having been founded by the Norman baron Evas (or Yves or Ives) de Belesme, who died around 993, and his wife, Godehilda. It is unclear how Rotroldus, the château builder, is related to Evas de Belesme: the pedigree below suggest he may have been Evas’s great-great-grandson, in which case he was the father of the Hastings warriors. The son of Evas and Godehilda, William, titled Lord of Belesme and Count of Alencon, served King Robert of France and William’s son Warrin, by his second wife Adelais, added Châteaudun by marrying Millicent, daughter of Count Hugh of Châteaudun, one of several marriages to have enhanced the family’s domain. Titles and lands were also acquired through war. 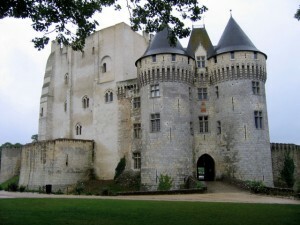 Warrin and Millicent’s son, Geoffrey, Count of Châteaudun, Lord of Mortagne, Nogent and Gallardon, founded the priory of St Denise de Nogent in 1031. Another family member, Geoffrey, who may have been a brother of Warrin, rebuilt the château in the 1020s, adding one or more stone towers. 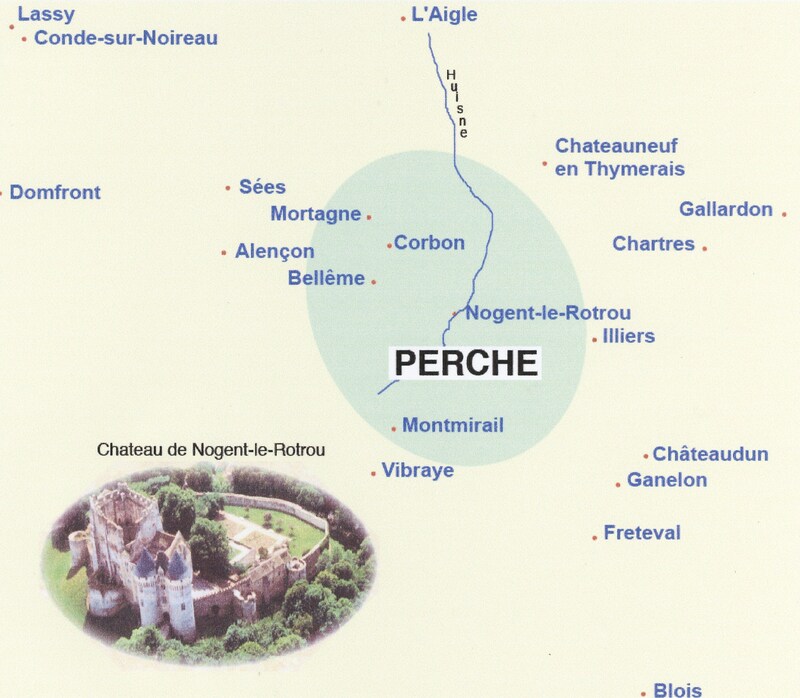 As is evident from the titles, the family by then controlled a large area of Perche and in 1079 took on the title of Counts of Perche, living in the fortified castle at Nogent for several generations, when they were not away fighting wars. It may have been a promise of spoils of war that encouraged Geoffrey, grandson of the founder of St Denise, and his brothers Rotrou II and Fulquois (or Fulke) to respond to William’s call for support with his invasion of England. All three fought alongside William at the Battle of Hastings with Geoffrey commanding a division. It is not clear whether they were rewarded for their service, after William became King of England. An early record of land ownership, the Domesday Book compiled in 1086, shows no lands in the name of de Nogent though they may have been granted lands outside the area it covered, in London or Winchester for example. Geoffrey and Rotrou II subsequently returned to their homeland whilst Fulquois, who unlike his brothers had no lands in France, settled in England, at least for a time, and is the progenitor of the English branch of the family. Geoffrey’s son, Rotrou III married Matilda, the daughter of King William’s son, King Henry 1, and built on his reputation as a warrior. Known as ‘Le Grand’, Rotrou III is said to have left Perche on six occasions between 1100 and 1144 to fight against Arabs in Spain or on Crusades to the Holy Land. He also found time to join forces with the Duke of Normandy – now Henry I, King of England, his father-in-law – to resist advances into Normandy by the army of the King of France. For this he was rewarded in 1113 with the lordship of Belesme – today known as Bellême – the second time the town was in the family’s hands. The line of descent of the French side of the family – known by the name Rotrou – appears to have died out in the 13th Century (possibly in 1226) because there was no male heir to succeed to the titles; their lands reverted to the king. Was Geoffrey who founded the Priory of St Denise in 1031 the same Geoffrey who rebuilt the château at Nogent in the 1020s, grandfather of Geoffrey II who fought at Hastings in 1066? 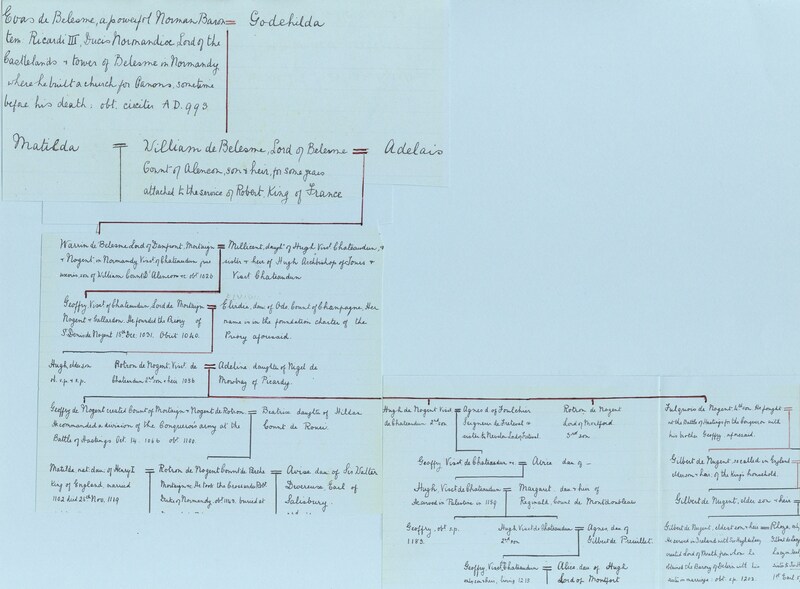 Sources: Nugent family tree (extract of pages 1, 7, 9) based on pedigree drawn by William Skey of Dublin in 1849; research by Francis Nugent Dixon as documented at website: http://www.nugent.fr/doc/Nugent01.pdf ; also: http://www.nugent.fr/P03103.htm (including maps); Wikipedia on Dukes of Normandy; château history (including image) http://www.casteland.com/pfr/chateau/eure_loir/nogent/nogentle_rotrou_hist.htm For more about the Château de St Jean at Nogent-le-Rotrou see http://www.nugent.fr/P03110.htm Also see on-going discussion in the Contemporary section of this website.